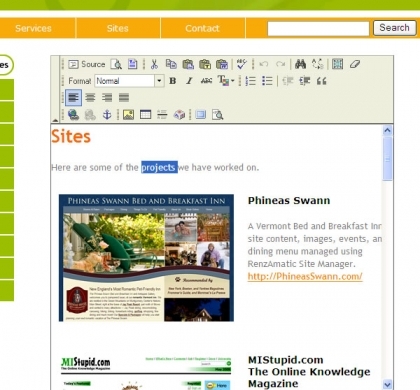 The What-You-See-Is-What-You-Get (WYSIWYG) editor included with site manager enables users to manage and update text in a simple to use Microsoft Word-like editor window. Once logged in, a page editor can browse the live site and edit any page right in place. Text formatting, tables, image placement, hyper links, and many more options are available. Clicking save is all that is necessary to make these changes live on the site. No HTML editing or FTP software is needed.